Part 1 in a series on avoiding, preventing, and treating poison ivy rash. An estimated 70 to 90 percent of people are allergic to urushiol oil, the culprit that causes the maddening rash when your skin comes into contact with poison ivy. To avoid it, the best strategy is to not come into contact with the plant in the first place. And to do that, you need to be able to identify it. This is true year-round, even in winter when the leaves are absent, because the entire plant (leaves, vines, stems, and roots) contains urushiol. Poison ivy is a common native plant throughout the Eastern U.S. and grows in a multitude of environments, from shady forest floors to sunny open fields. It can vary somewhat in its appearance and growth habits (climbing vine, low-lying ground cover, etc. ), but there are three traits that always appear—recognize them and you’ll know to avoid it. To help you remember them, here are three simple sayings to keep in mind. the longer stem of the middle leaflet. 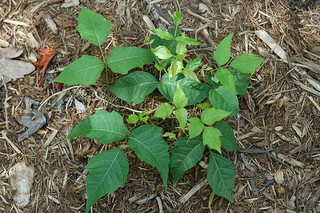 Poison ivy leaves always appear in bunches of three leaflets. (Botanically speaking, the three leaflets together technically make up the “leaf.”) These three-part leaves grow alternately from the main stem (as opposed to opposite, where two sets of leaves grow from either side of the same spot on the main stem). This saying is arguably the most repeated poison ivy advice, but can cause confusion since the leaves of several other plants display a similar appearance (blackberries, raspberries, box elder, etc.) and isn’t enough to definitively identify the plant (especially in the winter, when there are no leaves!) So move on to saying #2. Take a closer look at the suspected “leaves of three.” Poison ivy features a distinctive longer stem at the base of the middle leaflet. As a result, the middle leaflet extends farther out from the leaflet stem than the two side leaflets. 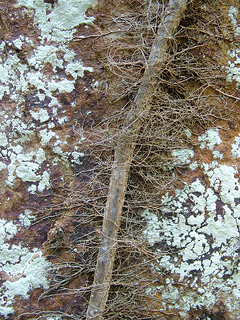 A “hairy” poison ivy vine on a rock. In the leafless season, you are most likely to encounter poison ivy on tree trunks, rock walls, or other structures where it can climb up as a vine. Poison ivy vines feature numerous distinctive small tendrils, or “hairs,” that the plant uses to adhere to whatever it’s climbing. Other climbing plants in the Northeast (Virginia creeper, Concord grape, etc) have smooth vines, making the distinction easy. Do you have a favorite saying about poison ivy? Please share!